Invasive fungal pathogens and pests of sweet chestnut (Castanea sativa Mill.) forests drastically reduce their productivity. The recently described Gnomoniopsis castaneae is one of the main agents involved in the epidemic of brown rot of chestnut nuts worldwide. In 2014, during an investigation aimed at evaluating the health status of chestnut forests in Sardinia, a high incidence of necrotic galls induced by the Asian gall wasp Dryocosmus kuriphilus Yasumatsu (Hymenoptera, Cynipidae) was observed. Several fungal isolates were consistently isolated from necrotic gall tissues. Based on their morphological characters and analyses of both the ITS and EF1-α-coding gene sequences, all isolates were identified as Gnomoniopsis castaneae. Parasitic fungi on Dryocosmus kuriphilus in Castanea sativa necrotic galls. Bulletin of Insectology 64: 269-273. 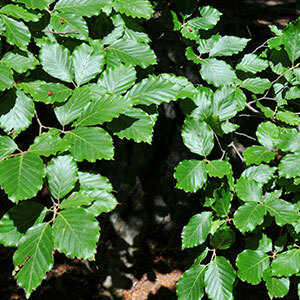 Morphological variation in chestnut fruits (Castanea sativa Mill.) in Tuscany (Italy). Silvae Genetica 35: 124-128. The biosecurity threat to the UK and global environment from international trade in plants. Plant Pathology 57: 792-808. Gall structure affects ecological associations of Dryocosmus kuriphilus (Hymenoptera: Cynipidae). Environmental Entomology 39: 787-797. Gnomoniopsis castanea is the main chestnut nut rot agent in Switzerland. Phytopathologia Mediterranea 54: 41-53. An evolutionary ecology perspective to address forest pathology challenges of today and tomorrow. Annals of Forest Science 73: 45-67. Data sheets on quarantine pests: Dryocosmus kuriphilus. EPPO Bulletin 35: 422-424. EPPO database on quarantine pests. European and Mediterranean Plant Protection Organization, Web site. Colletotrichum acutatum associated with Dryocosmus kuriphilus galls on Castanea sativa. Forest pathology 45: 169-171. Control of ink disease by trunk injection of potassium phosphite. Journal of Plant Pathology 91: 565-571. A plant pathogen causes extensive mortality in an invasive insect herbivore. Agricultural and Forest Entomology 17: 366-374. Chestnut gall wasp (Dryocosmus kuriphilus): spreading in Italy and new records in Bologna province. Bulletin of Insectology 61: 343-348. Widespread Phytophthora infestations in European nurseries put forest, semi-natural and horticultural ecosystems at high risk of Phytophthora diseases. Forest Pathology 46: 134-163. Effects of gall formation by Dryocosmus kuriphilus Yasumatsu (Hym., Cynipidae) on the grow of chestnut trees. Journal of Applied Entomology 121: 9-15. Phylogeny, morphology and pathogenicity of Botryosphaeriaceae, Diatrypaceae and Gnomoniaceae associated with branch diseases of hazelnut in Sardinia (Italy). European Journal of Plant Pathology 146: 259-279. Gnomoniopsis associated with necrosis of leaves and chestnut galls induced by Dryocosmus kuriphilus. Plant Pathology 59 (6): 1171-1171. Brown rot on nuts of Castanea sativa Mill: an emerging disease and its causal agent. iForest 6: 294-301. Specific PCR-primers as a reliable tool for the detection of white truffles in mycorrhizal roots. New Phytologist 141: 511-516. Interaction between two invasive organisms on the European chestnut: does the chestnut blight fungus benefit from the presence of the gall wasp? FEMS Microbiology Ecology 91 (11): fiv122. Native parasitoids associated with Dryocosmus kuriphilus in Tuscany, Italy. Bulletin of Insectology 66: 195-201. Gnomoniopsis smithogilvyi causes chestnut canker symptoms in Castanea sativa shoots in Switzerland. Fungal Genetics and Biology 87: 9-21. Rearing, release and settlement prospect in Italy of Torymus sinensis, the biological control agent of the chestnut gall wasp Dryocosmus kuriphilus. BioControl 53 (6): 829-839. Histological investigation on gall development induced by a worldwide invasive pest, Dryocosmus kuriphilus, on Castanea sativa. Plant Biosystems 150: 35-42. Chestnut blight in Europe: diversity of Cryphonectria parasitica, hypovirulence, and biocontrol. Forest Snow and Landscape Research 76: 361-367. Biogeographical patterns and determinants of invasion by forest pathogens in Europe. New Phytologist 197 (1): 238-250. First report of Phytophthora pseudosyringae associated with ink disease of Castanea sativa in Italy. Plant Disease 94 (8): 1068. Survey of the incidence of chestnut rot in south-eastern Australia. Australasian Plant Pathology 42: 63-72. The chestnut pathogen Gnomoniopsis smithogilvyi (Gnomoniaceae, Diaporthales) and its synonyms. Mycotaxon 130: 929-940. On the fungal species Gnomoniopsis castaneae (“castanea”) and its synonym G. smithogilvyi. Journal of Plant Pathology 98: 189-190. Natural occurrence of Fusarium proliferatum on chestnut in Italy and its potential entomopathogenicity against the Asian chestnut gall wasp Dryocosmus kuriphilus. Journal of Pest Science 88: 369-381. Natural spread of Cryphonectria parasitica and persistence of hypovirulence in three Italian coppiced chestnut stands. Forest Pathology 38: 227-243. Ink disease in chestnuts: impact on the European chestnut. Forest Snow and Landscape Research 76: 345-350. New notes on the biology of the chestnut fungus Gnomoniopsis sp. and its possible use as a biocontrol agent of oriental chestnut gall wasp. Acta Horticulturae (ISHS) 1019: 235-238. Does Gnomoniopsis castanea contribute to the natural biological control of chestnut gall wasp? Fungal Biology 121 (1): 44-52. Gnomoniopsis castanea sp. nov. (Gnomoniaceae, Diaporthales) as a causal agent of nut rot in sweet chestnut. Journal of Plant Pathology 94: 411-419. Morphological and molecular analysis of Fusarium lateritium, the cause of gray necrosis of hazelnut fruit in Italy. Phytopatology 101: 679-686. Fungal endophytes which invade insect galls: insect pathogens, benign saprophytes, or fungal inquilines? Oecologia 103: 255-260.